Santos mahogany vs red oak hardwood flooring – comparison chart. Which wood flooring is better? Santos mahogany (Cabriuva) is reddish to medium brown wood with distinctive grain variation. Light brown to grayish wood. After installation solid red oak strips or planks often stained in desire color. It is harder to work with Santos Mahogany wood in comparison to red oak. Red oak can easily chip or split, but it is much softer wood compare to Santos Mahogany what makes it easier to work with. Santos Mahogany floors will change the color with a time. Red oak change color with a time as well, but changes normally less noticeable. Dense wood structure makes Santos Mahogany floors extremely durable. Engineered or solid prefinished or unfinished strips or planks random length. Wood flooring strips or planks unfinished or factory finished in enormous variety of colors. Vary. Santos mahogany wood flooring is more expensive compare to red oak. 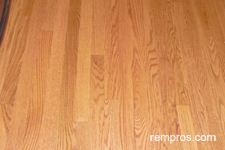 Red oak is cheaper hardwood in comparison with exotic wood species including Santos mahogany. Installation method and overall difficulty of work affect installation cost of wood floors at a first place. Wood species play insignificant role in labor cost determination. Similar to mahogany wood floors. Nailing down 5 in. wide Santos mahogany prefinished solid planks in 15’ x 21’ living room normally is a one day project for an experienced hardwood installer excluding any subfloor preparation work or baseboards installation. Experienced installer with a helper typically are able to perform installation, sanding and finishing 400 – 450 square feet of red oak flooring in couple 10’ x 12’ bedrooms, hallway and living room during 3 days including baseboards installation. Complex work or stain application will result in installation time increase. Santos mahogany and red oak are great flooring options with their own advantages and disadvantages. Mahogany is harder wood with its unique look, but exotic wood species are more expensive. 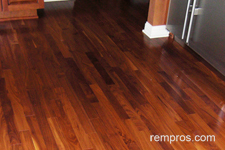 Red oak is one of the most popular hardwood flooring on the market. Red oak is durable wood and will last for decades with adequate care.